1 Combine Hellmann's® or Best Foods® Real Mayonnaise with vinegar; set aside. 2 Combine watercress, tomatoes, green onions, chile pepper and cilantro in medium bowl. Add dressing and toss well. 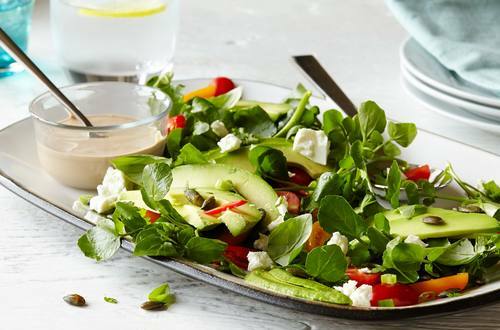 Arrange salad mixture on serving plates, then top with avocados, cheese, pumpkin seeds and basil.